Figure 1. Western blot analysis of CYP2E1 using anti-CYP2E1 antibody (PB9190). lane 2: mouse liver tissue lysate. After Electrophoresis, proteins were transferred to a Nitrocellulose membrane at 150mA for 50-90 minutes. Blocked the membrane with 5% Non-fat Milk/ TBS for 1.5 hour at RT. The membrane was incubated with rabbit anti-CYP2E1 antigen affinity purified polyclonal antibody (Catalog # PB9190) at 0.5 μg/mL overnight at 4°C, then washed with TBS-0.1%Tween 3 times with 5 minutes each and probed with a goat anti-rabbit IgG-HRP secondary antibody at a dilution of 1:10000 for 1.5 hour at RT. The signal is developed using an Enhanced Chemiluminescent detection (ECL) kit (Catalog # EK1002) with Tanon 5200 system. A specific band was detected for CYP2E1 at approximately 55KD. The expected band size for CYP2E1 is at 57KD. Figure 2. 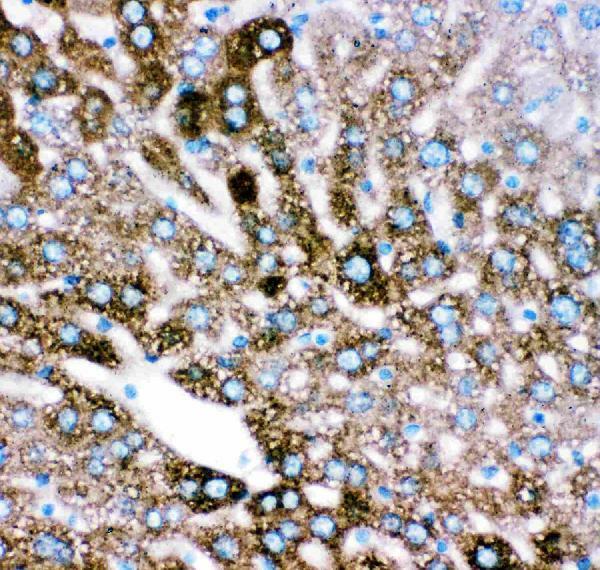 IHC analysis of CYP2E1 using anti-CYP2E1 antibody (PB9190). CYP2E1 was detected in paraffin-embedded section of mouse liver tissue. Heat mediated antigen retrieval was performed in citrate buffer (pH6, epitope retrieval solution) for 20 mins. The tissue section was blocked with 10% goat serum. The tissue section was then incubated with 1μg/ml rabbit anti-CYP2E1 Antibody (PB9190) overnight at 4°C. Biotinylated goat anti-rabbit IgG was used as secondary antibody and incubated for 30 minutes at 37°C. The tissue section was developed using Strepavidin-Biotin-Complex (SABC)(Catalog # SA1022) with DAB as the chromogen. Figure 3. 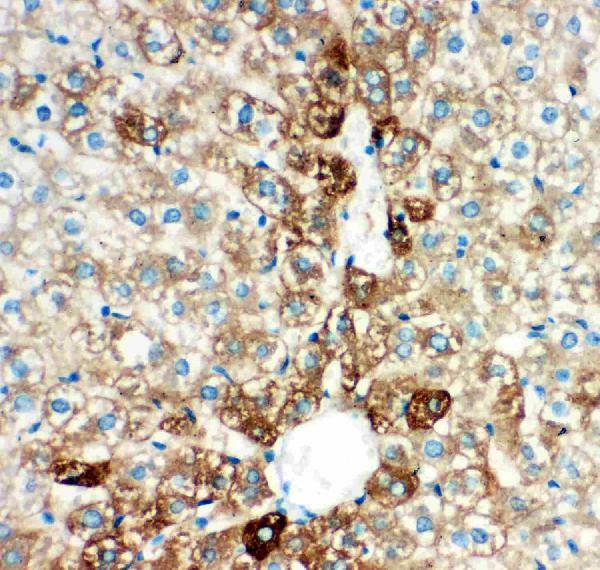 IHC analysis of CYP2E1 using anti-CYP2E1 antibody (PB9190). CYP2E1 was detected in paraffin-embedded section of rat liver tissue. Heat mediated antigen retrieval was performed in citrate buffer (pH6, epitope retrieval solution) for 20 mins. The tissue section was blocked with 10% goat serum. The tissue section was then incubated with 1μg/ml rabbit anti-CYP2E1 Antibody (PB9190) overnight at 4°C. Biotinylated goat anti-rabbit IgG was used as secondary antibody and incubated for 30 minutes at 37°C. The tissue section was developed using Strepavidin-Biotin-Complex (SABC)(Catalog # SA1022) with DAB as the chromogen. 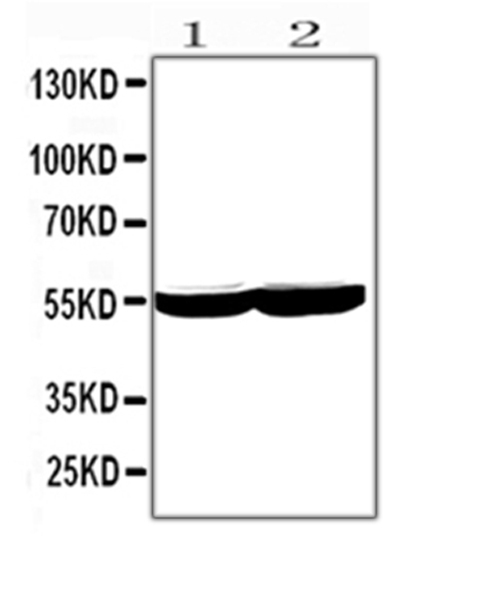 Rabbit IgG polyclonal antibody for Cytochrome P450 2E1(CYP2E1) detection. Tested with WB, IHC-P in Human;Mouse;Rat. E.coli-derived human CYP2E1 recombinant protein (Position: M1-Y310). Human CYP2E1 shares 73% and 74% amino acid (aa) sequences identity with mouse and rat CYP2E1, respectively. Concentration: Add 0.2ml of distilled water will yield a concentration of 500ug/ml. Endoplasmic reticulum membrane; Peripheral membrane protein. Microsome membrane; Peripheral membrane protein. Cytochrome P450 2E1 (abbreviated CYP2E1), a member of the cytochrome P450 mixed-function oxidase system, is involved in the metabolism of xenobiotics in the body. In humans, the CYP2E1 enzyme is encoded by the CYP2E1 gene. It is mapped to 10q26.3. While it is involved in the oxidative metabolism of a small range of substrates (mostly small polar molecules), there are many important drug interactions mediated by CYP2E1. Most drugs undergo deactivation by CYP2E1, either directly or by facilitated excretion from the body. Also, many substances are bioactivated by CYP2E1 to form their active compounds. In addition, CYP2E1 is an important enzyme for the conversion of ethanol to acetaldehyde and to acetate in humans. In the conversion sequence of acetyl-CoA to glucose, CYP2E1 transforms acetone via acetol into propylene glycol and methylglyoxal, the precursors of pyruvate, acetate and lactate. A: Yes, please contact us at support@bosterbio.com for more information about BSA-free antibodies and availability. The new BSA-free formula uses trehalose as a replacement to BSA. We have tested many alternative chemicals and found that trehalose protects the antibodies the best. Q: What is the immunogen sequence of this antibody? Is this antibody polyclonal or monoclonal? A: You can find the immunogen sequence under "Immunogen" and clonality in the product name. Q: What is the expected band size? Why is it different than the observed band size? 3. Alternative splicing: the same gene can have alternative splicing patterns generating different size proteins, all with reactivities to the antibody. 4. Amino Acid R chain charge: SDS binds to positive charges. The different size and charge of the Amino Acid side chains can affect the amount of SDS binding and thus affect the observed band size. Q: What is the suggested dilution ratio for Western Blot (WB), Immunohistochemistry (IHC) and or ELISA standards? What is the optimal pH for the sample? A: Check the datasheet for the product for details on dilution ratios for different experiments. You can find the datasheet button on the right side of the product page. Q: What is the protocol you used for your Western blotting (WB) and Immunohistochemistry (IHC)? A: Check our protocols under the tech support tab.